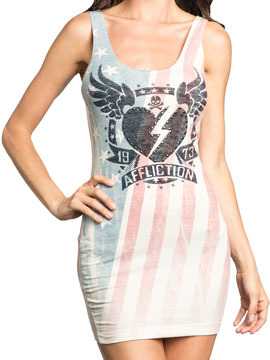 Affliction American Heartbreaker women's tank dress features the Affliction logo, black heart, angel wings, American flag, stars and stripes in the background. The back features a red, white and blue American Flag stars and stripes design. Perforated holes in heart shaped pattern across the back adds an extra edgy look. Looks great pair with denim or leggings. 90% Polyester 10% Spandex, light weight, Slim fit, soft and stretchy feel. Color: vintage white.